Over a year of planning and a lifetime of dreaming went into preparing our South Africa itinerary. We wanted to see as much as possible and maximize the time investment (24+ hours in transit each way), so we uncharacteristically took two full work weeks for this magnificent trip. Safaris, wine tasting, history, and relaxation – you can’t ask for much more than that. As with many of our vacations, what we thought was a once-in-a-lifetime adventure quickly evolved into a when-can-we-go-back trip. Our activities began immediately after arriving in Johannesburg. We met our tour guide for the day at the airport and set out to take in the city. Our stops included a mildly depressing visit to George Harrison Park, an historic mining site that has become home to local squatters, and a drive through the gritty downtown area. On the brighter side, we could feel the passion of the guides and visitors at the tiny Nelson Mandela house. A little outside of the city, the UNESCO World Heritage Site of the Cradle of Humankind gave us an underground glimpse into significant archaeological discoveries that have informed current understanding of human evolution. We spent the night at the elegant Morrells Boutique Estate in Johannesburg. After two nights spent on planes, nothing could have been more perfect. Very early in the morning, we returned to the Johannesburg airport to meet our transport company, Ashton’s. We followed Route 12 and then Route 4 on our way toward our game park destination, Klaserie Private Game Reserve. 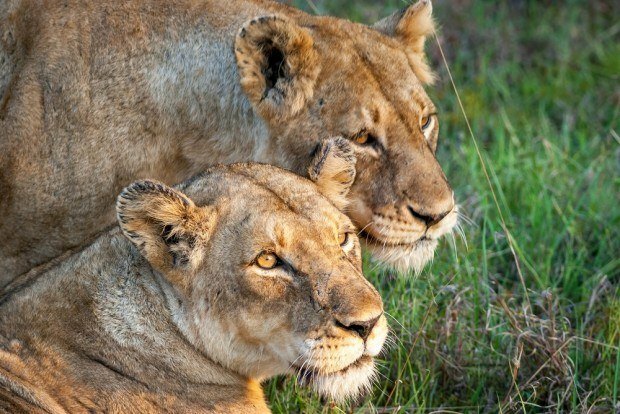 For 4.5 days, we alternated between then excitement of safari game drives and the relaxation of enjoying the South African bush. 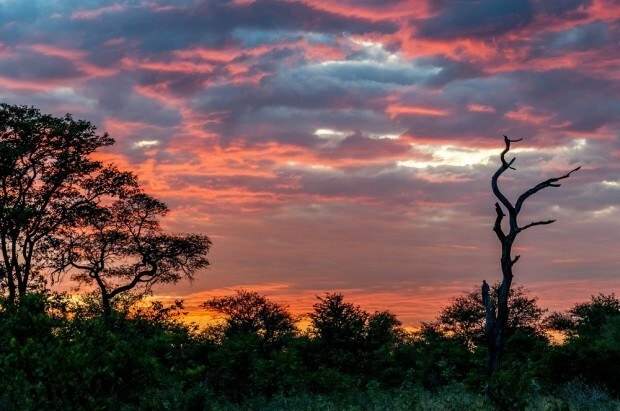 We spent two nights at nThambo Tree Camp and two nights at Africa on Foot just one kilometer away. Between the knowledgeable guides (who made sure we saw all the Big 5 animals), the delicious food, and the setting, we wanted to stay forever. Early on the morning of day 6, we left Africa on Foot bound for Hoedspruit airport for our flight to Livingstone, Zambia. 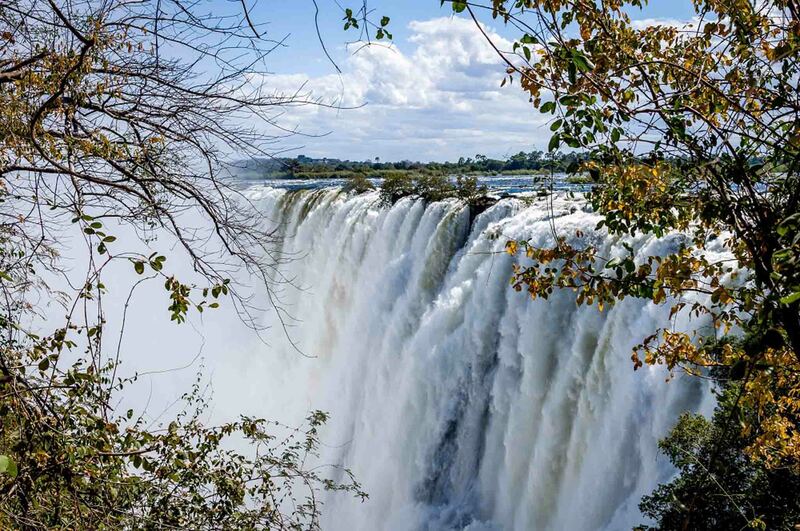 Our primary goal in visiting Zambia was to see Victoria Falls, the world’s largest waterfall, which was near peak flow during our visit. We also visited the Maramba market—a local market featuring everything from food to furniture—and the village of Siankaba, a small nearby enclave, to see how people typically live. We spent one of our days in Zambian just relaxing in the stunning beauty of our surroundings at our resort, the Islands of Siankaba. There were massages, sunset cruises, the rushing rapids of the Zambezi River, and more food than any two people could need. Heaven. Not every day on the road is exciting. Sometimes it’s just about getting to a new destination. We spent Day 9 on flights – first from Livingstone, Zambia to Johannesburg, and then from Johannesburg on to Cape Town. It was a long day, and we were glad when we arrived at our accommodations for the evening and the next stop on our South Africa itinerary, Long Street Hotel in the heart of Cape Town. The weather was nice at the coast but was not expected to be in the following days, so we changed our plans and got a slightly late start on our drive of the Cape Point route. We headed out on the picturesque Chapman’s Peak Drive toward the M65, which we took all the way to Cape Point (and the visitor’s center there) and the Cape of Good Hope. Along the way, we stopped to gaze at the unusual plants and animals in the area and the beautiful views along the coast. After some time exploring the area, we headed north up the M4 to see the penguins at Boulder’s Beach. Who doesn’t love penguins? Since we had changed our plans to make the best use of the weather, we were a bit far from our accommodations for the evening. From the Cape, we headed East on the N2 followed by the M43 past the town of Hermanus. Just before (the exceptional 4-course wine pairing) dinner, we arrived at Grootbos Private Nature Reserve, a luxury reserve in every sense, which showcases the exceptional biodiversity of the area along the coast. On day 11, the weather turned stormy and very windy, leading to the cancellation of our great white shark diving expedition. But that didn’t leave us at a loss for things to do. Thankfully, the Hemel-en-Aarde Valley near Hermanus is not only beautiful but is also home to a number of different wineries. 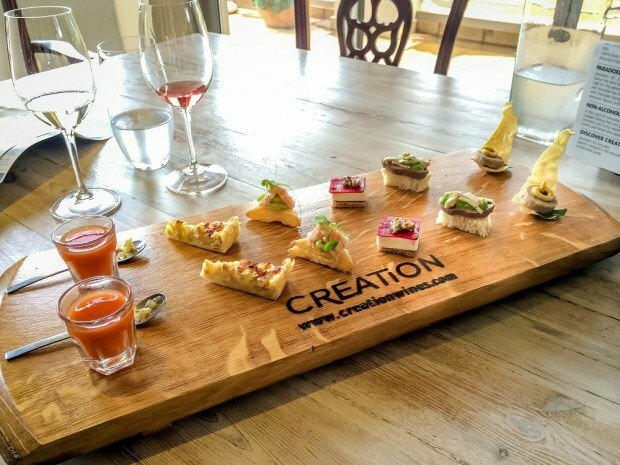 We enjoyed a delicious wine and food pairing at Creation Wines and a visit to Suma Ridge winery. Day 12 included a visit to several wineries in the Constantia wine region, including the famous Groot Constantia and Klein Constantia wineries. Both nights were spent at Hout Bay at the welcoming and elegant Tintswalo Atlantic. 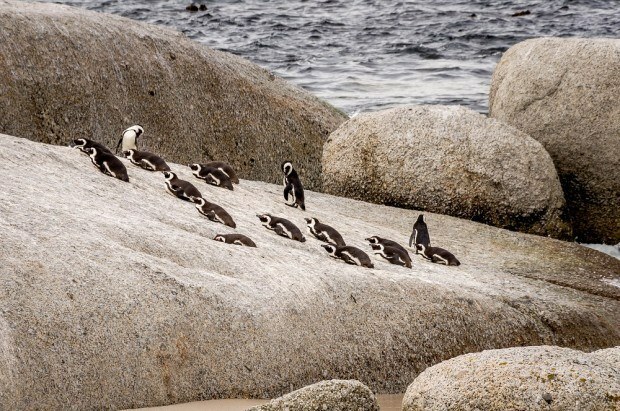 After a leisurely breakfast at Tintswalo Atlantic and a quick check of the weather, we determined that Day 13 was—at long last—the day to venture to Table Mountain and explore Cape Town. Following our visit to the dramatic landmark, we headed for our new digs, Lawhill Luxury Apartments near the V&A Waterfront. We spent the afternoon having a late lunch at the Market on the Wharf and browsing through the craft markets and shops that line the area. Dinner was at the delicious Asian fusion restaurant Umi just off the beach in Camps Bay. On our last day in South Africa, we headed about 45 minutes from Cape Town to the Stellenbosch wine region. A quick drive east on the N2 and south on route 304 landed us in this region famous for its distinctive reds. We visited several wineries—including one that was hosting a food and craft market—before beating the blustery weather back to our apartment to pack up for our flight home the next morning. Hotels: There’s a wide range of accommodation options in South Africa. You can find a broad range of accommodation options at Booking.com, which has a large number of properties across South Africa. Rental Car: We recommend renting cars from brand name, larger international companies or from reputable rental car sites. They tend to be more reliable and willing to help you if you have a problem, they tend to be more reliable. Before you go, we recommend getting a copy of our book, The Essential Guide to Driving Abroad, which demystifies and simplifies the process of renting overseas. Travel Insurance: Visiting South Africa is a trip of a lifetime. Given the relative cost of the trip, this would be one instance where we’d buy travel insurance. We bought our travel insurance from Travel Guard. Booking through these sites may help support Travel Addicts and earns us a few pennies to help with the web hosting, all at no additional cost to you.